DR. LETTIE ALLEN WARD was born March 3, 1859 to Aaron and Anna Bates Ward. 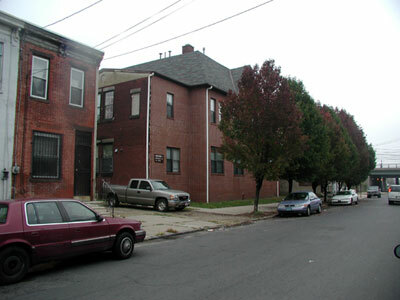 The family then lived in Camden's North Ward. Her father, then member of Camden's City Council, left to fight as a Captain for the Union during the Civil War, returning home in 1863 after being shot through the left lung at Fredericksburg. The oldest child, she was followed by a brother Franklin, and a sister Hannah. 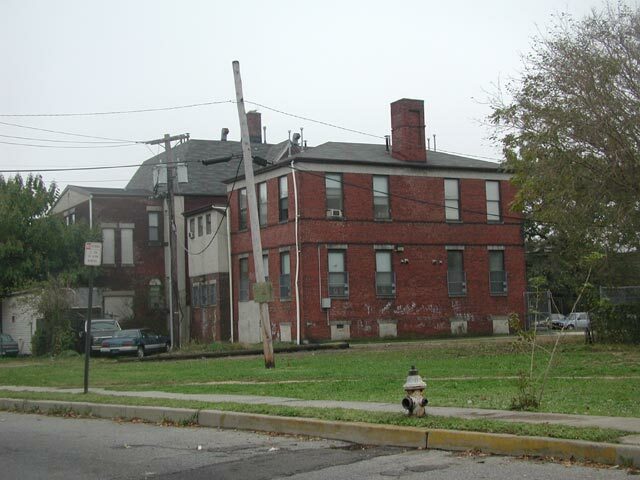 Her father had engaged in real estate and insurance after returning to Camden In 1864 the Ward family lived at 323 Plum Street. Plum Street was later renamed Arch Street. He was involved in real estate and insurance by the time of the 1870 Census. Around 1874 Aaron Ward established a business as a "street and road" contractor. The Ward family then lived at 821 South 8th Street between Pine and Division Streets. Aaron Ward also operated his business out of this location. Aaron Ward saw that his oldest daughter received a good education. She graduated from the Normal School for Teachers in 1875, and eventually obtained a teaching position in the Camden public school system. 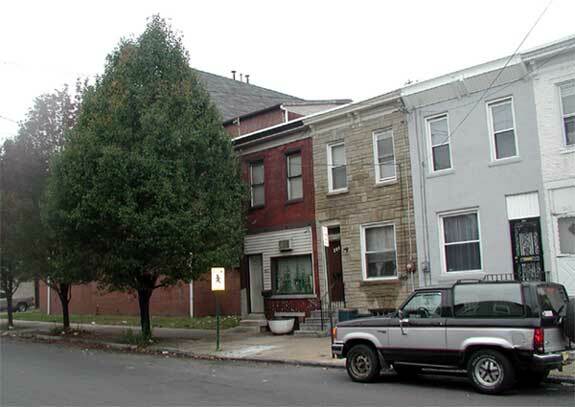 In 1887 she was teaching at the Liberty School at the corner of Spruce Street and South 8th Street, near her home. 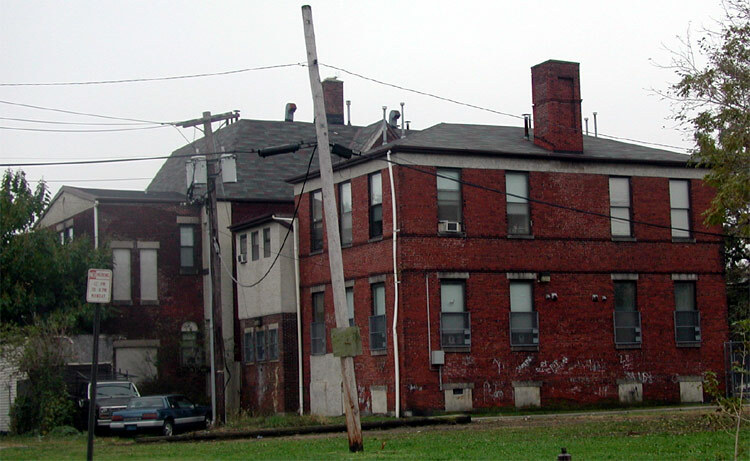 She eventually was made principal at this school, and by 1890 was serving as principal of the Jesse W. Starr School at 821 Pine Street. Lettie Allen Ward having become acquainted with the story of Camden physician Dr. Sophia Presley, who had become a doctor after first working as a school teacher for almost a decade, determined to do the same. Returning to school after 20 years, she graduated from Woman's Medical College of Pennsylvania in 1897. 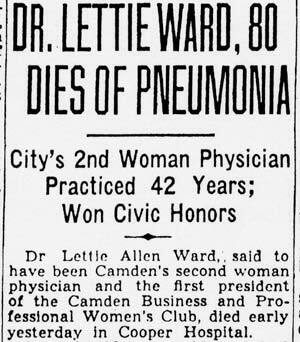 Dr. Ward was, according to her obituary, the second woman to practice medicine in the city of Camden. She practiced general medicine and specialized in ailments of the ear, nose, and throat (otorhinolaryngology). She delivered babies at a home for women Wright Avenue in Camden. Professionally, Dr. Ward was a member of the Camden County and Camden City Medical Societies; and the New Jersey Medical Woman's Association, and was the first president of the Camden Business and Professional Woman's Club. 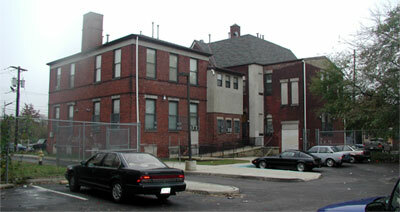 By the 1900s Dr. Ward had her office at 704 Broadway. At the time of the 1910 Census her neighbor at 708 Broadway was department store magnate William Leonard Hurley. After moving her home and office to the 600 block of Cooper street which was razed when Broadway was extended to the Bridge Plaza, she bought the house at 325 Cooper Street. 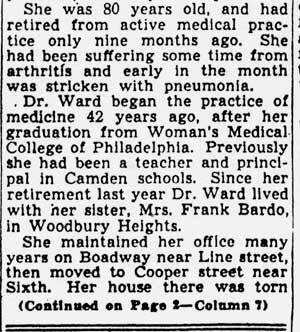 Dr. Ward practiced on the first floor and lived above until her retirement in 1938. She then moved to the home of her sister in Woodbury Heights NJ. Dr. Lettie Anne Ward never married. 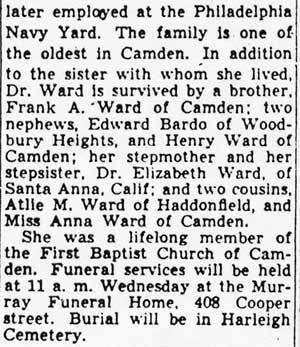 A lifelong member of First Baptist Church in Camden, she died on March 22, 1939 at Cooper Hospital. She was buried at Harleigh Cemetery. 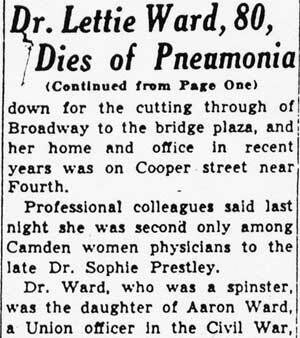 In Dr. Ward's time, her fame as one of Camden's female physicians was second only Dr. Sophia Presley. Besides Dr. Ward's father, who was a quite well known figure in Camden prior to his death in 1915, she numbered among her relatives E. Allen Ward, the contractor who in 1875, erected Camden's City Hall, which was completed and occupied the following year, and served as Camden's seat of government form 1876 through 1930. State and National officials of the Federation of Business and professional women will address the Camden branch at its January meeting in the Hotel Walt Whitman on Thursday evening. Miss Virginia Montgomery, National Federation program chairman and Miss Mary L. Johnston, New Jersey federation president, are slated to make the principal addresses following dinner. Dr. Lettie Ward, president of the Camden branch will preside. Miss Mary A. Fenimore of this city, new president of the Camden County Business and Professional Women's Club, announced her committee appointments for the 1933-34 season at the annual luncheon held at Boxwood Lodge, Lumberton. 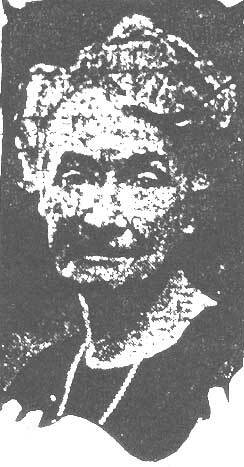 Miss Fenimore succeeds Miss Bessie Y. Stewart, of Haddon Heights, who has served for the last two years. The following appointments nave been made: education, Mrs. Lelia D. Wiggins, Haddonfield; emblem, Mrs. Clara F. Ramoth, Audubon; finance, Miss Christina F. Lacy, Camden; health, Dr. Lettie Allen Ward, Camden; international relations, Miss Bessie Y. Stewart; legislation, Miss Mary E. Grisel, Collingswood; magazine, Miss Mary A. Evaul, Haddon Heights; membership, Mrs. Cecelia Bailey, Camden; music, Mrs. Myrtle Johnson, Camden; publicity, Miss Maud Lawrinson, Merchantville; public relations, Miss Helen Farrell, Camden; program, Miss Helen A. Buecker, Camden; research, Miss Florence L. Tisdale, Haddonfield; and transportation, Miss F. Victoria Kebler, Haddonfield. In addition to Miss Fenimore, officers installed were Miss Jessie L. Winkworth, Haddon Heights, first vice president; Miss Emma Davenport, Camden, second vice president; Mrs. Marguerite A. Mitten, Laurel Springs, corresponding secretary; Miss Beatrice E. Caldwell, Camden, recording secretary and Miss Nettie M. Jones, Camden, treasurer. on Cooper Street, where she had her office and also lived upstairs. Thanks to Aaron Ward's great-grand-daughter for her help in building this page.